What Are Critical Ranges for Glucose? Immediately after your baby's birth, the attending medical staff assesses her vital signs to ensure that the birthing process did not have any adverse effects on her health. These vital sign checks are performed at one and five minutes after birth, and they assess your newborn's heart rate, breathing rate, color, activity and grimace reflex. The normal vital signs are a heart rate above 100 beats per minute, a breathing rate between 30 and 60 breaths per minute and the presence of red or pink coloring, active muscle tone and a grimace response. The physical birthing process can be traumatic to both mother and child. It is critical to assess the health of the newborn immediately after birth to determine whether intervention is required. Measuring vital signs is a quick and objective way to check the baby's health and decide whether it will be necessary for intensive care. 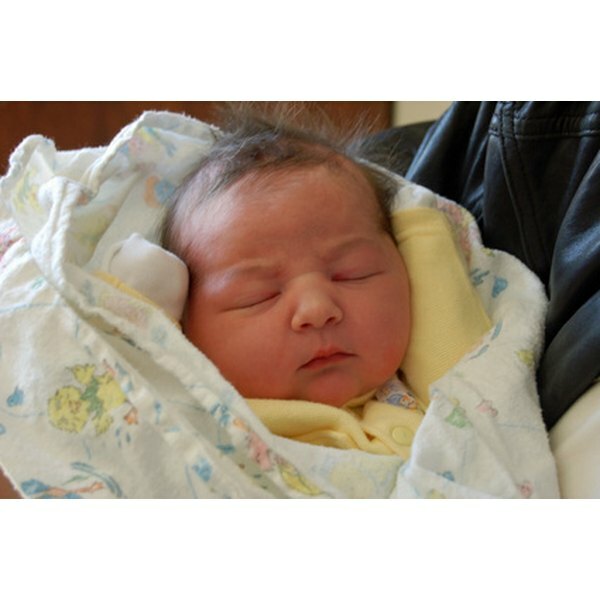 The most common vital sign measurement method is called the APGAR Score for a child. This scale measures five distinct vital processes: Activity, Pulse, Grimace, Appearance and Respiration and assigns a score from 0 to 2 for each process. An APGAR score is measured at one and five minutes after birth, with a maximum (healthy) score of 10 and a minimum of 0. A normal score is between 7 and 10 at both one and five minutes, but a score below 7 might require intervention. A score below 3 requires immediate resuscitation. For each of the vital processes, there is a normal range of values. For heart rate, above 100 beats per minute score 2 points on the APGAR scale, but the true normal range is between 130 and 160 beats per minute. According to Children's Hospital in Boston, a normal respiratory rate is between 30 and 60 beats per minute. A normal temperature is 98.6 degrees F, and the newborn should be able to maintain a stable body temperature in regular hospital room. A physician combines the vital sign measurements with a normal newborn examination to make an objective assessment of the child's health. The newborn examination includes observation of the child's head and neck, checking for pulses throughout the body, observing the openings of body canals and checking for movement throughout the extremities. Despite the initial trauma of birth, the newborn is normally quite active immediately after birth, and allows observation of these vital processes. If you observe any of your newborn's vital signs straying from the normal range, you should be sure to tell your physician immediately. Even newborns who have normal APGAR scores in the five minutes after birth can develop problems later, and a change in vital signs is often the first indication of something that has gone wrong.